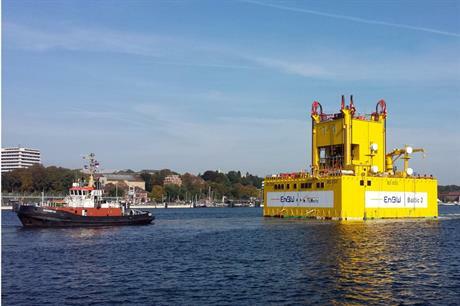 GERMANY: The substation for the Baltic 2 offshore wind farm in German waters has set sail to the site. Project developer EnBW said the topside of the transformer platform has now left the port of the northern German city of Kiel to take advantage of a good weather report. It will be tugged out to the site 32 kilometres from the German Baltic coast. Alstom Grid was contracted to manufacture the substation. The foundation for the structure is already in place and was fabricated by WeserWind. Installation of the Siemens 3.6MW turbines started in August, and is expected to be complete before the end of the year.